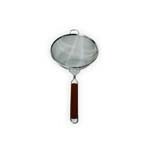 Stainless Steel Strainer - 10" - Texas Brewing Inc. Stainless Steel Strainer - 10"
Stainless Steel Strainer- 10" diameter: Simply place one of these sturdy strainers on top of your fermenting bucket, and transfer your wort through the strainer as it enters the bucket. Stainless steel construction, with wooden handle. Fits our 6.5 gallon buckets perfectly.